Information portability and user mobility has become an integral part of life and the modern workplace. Just as important, is the portability of the hardware it’s accessed on. While smartphones are getting smaller and smarter, the sheer amount of information users want to access is growing exponentially. Cloud computing is not a brand new concept (one can hardly watch an hour of television without some commercial referencing the cloud), but it’s also not a fad technology. Used properly, the cloud can solve data portability and performance issues, all without increasing security concerns. Because the cloud enables users to access information from any web-enabled mobile device or wherever a data connection exists, it is the ideal tool for accessing multi-user data stores. The externally-based storage that the cloud provides means devices with limited memory can save local memory for more robust and memory-intensive applications. Another important benefit is that there is a much smaller risk of losing data by having it stored exclusively on hardware that is designed to be taken out into the world. The amount of data that can be stored in the cloud is entirely unrelated to the limitations of mobile devices; you can easily upgrade your database or file servers without any upgrades to your work-force’s smartphones. Choosing to store data on a cloud also means that developers can focus their resources on the application itself, and not have to worry about complicated memory-saving routines, saving hours (and dollars) in a development life-cycle. These benefits make for great reading to an IT Director, but their impact is felt and matters well outside the confines of the IT department. Using a cloud system along with mobile technology can make an entire workforce mobile – managers can orchestrate work-flow and resources, salespeople can access the CRM and billing systems, technicians can access job systems and tech specs, designers can contribute and collaborate on creative projects, and all of these things happen from wherever the person happens to be. Of course, all of that data floating around in the seemingly-uncontrolled ether is frightening to some people, especially in the wake of several well-documented data thefts from companies like Sony. The cloud is not, by itself, a security concern though. Poor implementation of security measures, however, can be a real issue, and that’s why informed decisions need to be made at the beginning of a project. Cloud security doesn’t just begin and end with secure data. User activity should be controlled through a device ID which adds an additional security layer. An individual user’s credentials are linked to the mobile device they use via a device ID (similar to a MAC address on a network). Implementing this security layer means that you can be more comfortable that the person who is accessing the cloud truly is the person to whom those credentials are assigned. You have the flexibility to allow credentials to be used only on certain devices, or even only from certain regions. It is even more important than in traditional client/server models, that data should be stored on the cloud servers in an encrypted format. The NSA (National Security Agency) endorses the AES methodology (and in fact, it is the first publicly accessible and open cipher approved for top secret information). The standard comprises three block ciphers, AES-128, AES-192 and AES-256, adopted from a larger collection originally published as Rijndael. Each of these ciphers has a 128-bit block size, with key sizes of 128, 192 and 256 bits, respectively. The AES ciphers have been analyzed extensively and are now used worldwide. Ultimately, the cloud is here and here to stay. It’s important that businesses creating mobile applications take advantage of the unrestricted mobility that it grants, but it is just as important that they make careful security decisions at the outset. 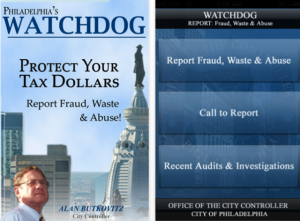 < Working closely with Philadelphia City Controller Alan Butkovitz, Vensi has created a Watchdog application for Apple® iPhone, iPod Touch & iPad. The mobile app was designed to empower citizens to report fraud, waste, abuse and damages to public property directly to the Philadelphia Controller’s Office. The Philadelphia City Controller’s Office and Vensi are currently working on the development of an Android version of the Watchdog app. Vensi asserts that it can build the app for other communities and organizations seeking cost-effective rapid response mobile technology solutions. Read the full press release here. As a premier mobile development firm, Vensi understands the growing importance of technology in business success. Technology is an evolving tool, and mobile applications offer businesses the ability to improve not only their internal efficiencies but also revolutionize a company’s approach to marketing, customer engagement, and sales. Just as brick and mortar businesses had to adjust their approach to marketing by developing websites and e-commerce sites, and online businesses have had to embrace social media to survive, Vensi recognizes the value of using mobile platforms to improve the ability of businesses to reach their customers and realize internal efficiencies. Allowing the information from your website to be easily, yet safely accessible by people using mobile devices such as iPhones, iPads, BlackBerrys, Androids, and Windows Phones is a crucial element in any effective business strategy, and choosing the right mobile development firm can have an incredible impact on your image and bottom line. Vensi sees mobile applications as part of the entire branding, sales, and productivity package businesses need for success. A company’s website and its mobile applications should be like good siblings – similar enough to be recognizable as coming from the same company and get along well for an optimal experience. It is very important to develop mobile applications for iPhone, iPad, Android, Blackberry, and Windows Phone that have a consistent look and feel with the website. Consistent and cohesive branding establishes identity, improves brand recognition, and encourages customer engagement. The concept is similar to old days of having your business logo appear on your business cards, letterhead, ads, and signs, but the power behind creating a cohesive design for web and mobile platforms is amplified by the reach of the internet and wireless networks which will continue to grow exponentially years into the future. As a 21st century business, staying competitive regardless of your industry or niche requires taking full advantage of the technology that brings you into the homes, hands, and minds of your staff and customers. In the last few years, mobile technology has revolutionized the way people work, find information, shop, and develop brand loyalty. Even though there is an “app frenzy” going on, as people become accustomed to their 3G and 4G phones and all of the options they have to enrich and simplify their lives, Vensi foresees that the future of mobile application development will provide businesses opportunities to save time and money, extend their brand, deepen their relationships with their customers, and increase revenues and yes, even profits. The key to long-term success is to recognize the ways in which your target market and staff uses its phones, and to then take full advantage of the extraordinary opportunities created by mobile technology. Phones are both deeply personal and ultimately social, and the marketing methods that leverage/capture a sense of relationship while offering convenient, time-saving access to your business will position you to remain competitive even as the landscape continues to evolve. There is a world in the not-so-distant future where a mobile device will be completely customizable to the taste of the end-user. Maybe you want a camera, e-reader, access to every version of “Spoonful” ever recorded, and various apps but no phone. Maybe you want to videoconference and simultaneously monitor your child napping in his crib. Maybe you need an add-on blood sugar monitor to manage your diabetes. For the greenies out there, surely there will be an app for recharging your device with the wind outside your train window. Cloud computing, augmented reality, geolocation – the options are limited only by our imagination and our paradigms. Today, right now, mobile technology pairs beautifully with the trend toward simplification in our lives. We can eliminate the clutter by traveling with paperless tickets, banking online, using GPS instead of maps, presenting digital coupons to store clerks, and reading eBooks. It is only our sense of nostalgia, and to some extent our fear, that keeps us clutching to a security blanket of paper. Who knew mobile applications could help clear the way to a state of Zen? This brings humanity to the biggest change.- the change in perspective and how we approach the moments that make up our lives. Mobile technology helps us preserve our past with digital images, art, music, blogs… so that we can let go. We know that it is there, accessible from any place at any time, and we can get on with the business of living our lives. In living a moment, we can use the mobile applications to embrace every element, giving the experience more texture and color. We can click on an app and learn on which slope the grapes in our Riesling were grown. We can hold our mobile device up to the sky and learn the name of the star we have wished upon since childhood. We can connect with a dear friend and share a funny thought that reminded us of a shared experience. Our lives are richer, fuller, and more connected to one another in so many beautiful (and really cool) ways. Our fundamental work at Vensi is to design and create quality, highly optimized mobile solutions that improve productivity on any platform. Choosing the right mobile development firm is critical to the success of your app, and Vensi firmly believes that the development firm should take the time to learn about your business and industry, understand the function of your app, and anticipate your needs by thinking in new and creative ways about the role of technology in our world . How do we design mobile applications? We do it in collaboration with you, the client. Whether you come to us with nothing but an idea in your head or have nothing more than some scribbles on your morning latte cup, we can take your idea and transform it into a multi-platform, highly functional application suited specifically to your needs. Vensi believes that collaboration leads to innovation. We think and work differently. Our company culture is open, communicative, global, collaborative, and imaginative. We watch every industry trend, and we are bold when it comes to trying something new. This environment allows us to stay ahead of the curve in concept, design, and architecture. We keep technology fresh in ingenious ways and it is evident in our mobile application solutions and products. Our collaborative approach carries through into our development process. In order to ensure that you are getting exactly what you are looking for in your application, Vensi uses a storyboard process. Prior to beginning the development phase of your project, we create each screen of the app as part of a storyboard, allowing you to visualize precisely how the app will look, feel, and function. This provides the opportunity to get feedback from the client and make necessary changes. You have the opportunity to see the conceptualization of the application ahead of time with the storyboard and this fuels inspiration and provides an efficient method for identifying unanticipated needs before delving deeply into the development process. Storyboarding saves our clients time and money because we make it an integral part of the process. The ultimate goal of mobile application development is to bring things together, be it individuals, businesses, global workforces, concepts, infrastructure, or devices. We believe that mobile applications can and constantly do change the way people and companies interact in elemental ways. These connections make us all more productive, and they make our daily lives more interesting and enjoyable. 3G technology has truly revolutionized the world. Vensi believes that we, as a culture, will look back on this period of time and see that it was as important as the industrial revolution in terms of the impact it has on society. One of the great things about technology is that it changes rapidly and makes our lives more convenient and more productive. One of the downsides of that process, however, is being able to keep up with the changes. As a consumer, it may not be important to understand every change that occurs behind the scenes, but as a mobile development firm, staying on top of the changes is what makes the developers at Vensi some of the most sought-after talents in the world. We know Vensi isn’t the right match for every company looking for a mobile development firm, but we have created a checklist to help you determine how to find the right mobile development firm for you. □ Does the mobile development firm you are considering already have several successfully published applications for each major platform? □ Do the company’s developers represent a well-rounded talent, with experience on multiple platforms including Android, Blackberry, Palm, and J2ME? □ Does the portfolio of the mobile development firm indicate that it has not only the technical capability but a level of creativity that will enhance any application developed for you? □ Does the mobile development firm listen to your needs, respond to your ideas, and share their unique perspective based on their experience? □ Is the mobile development firm willing to sign a non-disclosure agreement that provides you with some security concerning the development of your application? □ Does the mobile development firm consistently meet deadlines? (It is perfectly ok to ask to speak to references in order to determine whether or not the firm will meet your needs). □ Does the mobile development firm work hard to make sure their developers understand what you want out of your application, including creating storyboards and other visual presentations? □ Does the mobile development firm stay within the budget and time frame you require? □ Does the mobile development firm work with you, include you in the process, and truly partner with you to ensure the success of your application? □ Is the mobile development firm approachable and willing to work with you to make your vision a reality even if you do not have a strong technological background? As you shop for the right mobile development firm, we invite you to use this checklist as a way to ensure that you are finding the right company to meet your needs. While it may seem as though iPhone and Android are battling it out for the top spot as the must-have phone OS, many businesses still prefer the reliability, security, and functionality of the Blackberry. What this means for mobile platform developers is that it is still important to develop applications for the BlackBerry platform and not focus exclusively on the other ‘Big 2’. Vensi is uniquely positioned to provide superior mobile applications for businesses that can be used across all three of the major platforms. More than 14 million users, including the U.S. Government, rely on BlackBerry for everything from phone calls to calendar management to email. The BlackBerry offers users an integrated package that uses push technology using the BlackBerry Enterprise Server (BES) to provide quick access to email and corporate networks without compromising security. BlackBerry’s security encryption is what made the platform the government’s first choice for a wireless solution. The data contained on a BlackBerry remains safe even if the phone is lost or stolen. While many mobile platform developers have stopped creating applications for the BlackBerry, Vensi believes that BlackBerry will continue to be a viable and necessary platform to support. Blackberry apps have been around for a long time — long before iPhone and Android apps. A properly designed app for BlackBerry can be reused with other mobile phones running J2ME. For example, a J2ME app can be ported to BlackBerry by reusing some core logic. Similarly, a BlackBerry app can be ported to J2ME phones. Even though the iPhone is a large draw for mobile application developers, followed closely (and perhaps soon to be overtaken) by Android, the BlackBerry is still critical. And because Blackberry follows the Sun Java standards, they’ve had no issue with Oracle, which could pose a problem for developers. Oracle just filed suit against Google regarding Android. With fewer mobile platform developers even providing development for the BlackBerry, Vensi’s decision to develop applications for all three platforms sets the company apart. From our point of view, since Blackberry has the largest market share, developing mobile applications for the BlackBerry is a must, particularly for business-to-business and business applications that foster productivity. The learning industry (companies that focus on providing training) should focus on BlackBerry as well, since they are the phones most businesses have. If you want your app with the top-level executives for sales trainings, business compliance trainings, and other learning apps, Blackberry is the way to go. For those who think Blackberry is all business and no fun, we suggest taking a look at Blackberry’s social networking feature. Blackberry’s BBM (Blackberry Messenger) app rivals its counterparts in the social realm. BBM™ allows users to send and receive messages with no character limits and choose a display picture that is sent with the messages. The app turns the phone into a mini social network by allowing users to share photos and videos with several contacts at the same time. As well, RIM recently acquired QNX, a popular operating system in automotive known for its reliability. We’re betting BBM™, QNX and its existing infrastructure, as well as the efforts Blackberry is making to reposition themselves to capture the less corporate crowd will keep them viable and competitive in the coming years. It’s our hunch that BlackBerry will rise to the top as the most reliable phones. What do you think about when you hear the name Vensi? The team of developers working at Vensi knows that, more than anything, Vensi stands for excitement and opportunity. Excitement at being able to put their talents and expertise to good use by creating the cutting edge technologies that will define the future of global business, and the opportunity to be a part of a talented team dedicated to transforming and streamlining business operations for their clients. Vensi is a mobile platform developer, but not just any mobile platform developer. They are one of the premier developers in the country, offering application development for all major platforms, including iPhone, Droid, and Blackberry. Vensi is quickly becoming one of the top places where new talent wants to be. What is the greatest part of being a Vensi team member? Being able to take a time-consuming process that saps energy and time from the business and transform it into an innovative, time-saving solution that keeps the client’s energies focused where they need to be. Whether clients are looking for a better work-life balance, a way to streamline operations or ways to increase efficiency and workload without overloading their employees, the Vensi team is up to the challenge. In fact, it’s the challenge of innovation, of developing a never-before used mobile platform, that makes being on the Vensi team such an incredible experience. Our blog will offer us the ability to share the progress on our latest mobile platform innovations. As well, it allows us to give a voice to our team of talented developers, who are truly shaping the way we will use mobile platform technology now and in the future. We welcome you to discover the Vensi difference as you explore our approach to making technology accessible, practical, reliable, and functional. Vensi is a 21st Century mobile platform development company that recognizes the importance of looking forward, anticipating need, and having solutions in place before they are recognized. By taking the time to learn about our clients and their customers, our development team is capable of identifying a variety of ways in which we can utilize mobile application technology to assist our clients in leveling the global playing field. Not only does Vensi offer a wide variety of custom-tailored services, but our team strives to create synergistic mobile applications that place our clients ahead of curve when competing in the global environment. What sets us apart is our desire to provide elegant solutions that function across a wide variety of platforms, including iPhone, Droid, and Blackberry. We are committed to being more than just a provider of mobile platform development; we believe in partnering with our clients to ensure that we develop innovative and sustainable solutions. From mobile applications to data management to teaching our clients’ employees how to use the most advanced technologies, we have solutions that let our clients remain competitive and join us on the cutting edge. By providing a supportive workplace that fosters innovation, creative thinking, and an element of experimentation while maintaining the highest standards of quality, Vensi often surpasses client expectations with the development of mobile platform applications and solutions that go beyond simply solving a problem. Our success comes from our committed and dedicated employees, whom we value above all. We believe work does not have to be dull or serious to be efficient and effective, and provide our employees with a relaxed and fun atmosphere that fosters their creativity. We look forward to sharing more of our story with you.